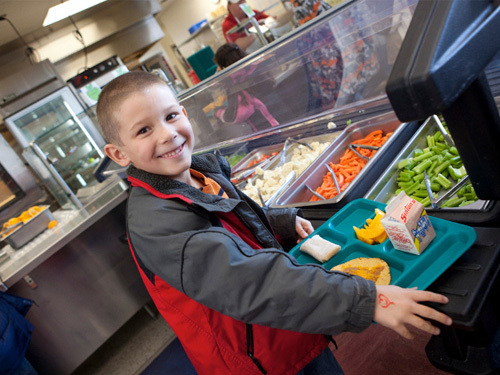 LiveWell’s School Food Initiative (SFI) believes that school lunch deserves more than a heat-and-serve buffet. Move over chicken nuggets! Because we know education doesn’t stop at the front doors of the cafeteria, the SFI places great value on school lunch as a teaching tool. We encourage districts to position their employees as lunch educators, and their programs as models of positive eating environments that promote wellness and good health. There is no better opportunity to teach students about the awesomeness (and deliciousness!) of fruits & vegetables than through their salad bars. If you’re struggling to promote your program and “selling” fresh fruits and vegetables, which are required components, there are plenty of event-specific opportunities in which to utilize. Colorado school districts can use a variety of fun events to celebrate and promote their salad bar items. Holding Rainbow Days, as the Boulder Valley School District suggests, is a great activity for kids that introduces the concept of “eating a rainbow”. Additionally, districts can participate in National School Lunch Week, sponsored by the School Nutrition Association, which goes above and beyond with a helpful toolkit to get your team ready for celebrating the importance of a nutritious school lunch. However, my personal favorite event each year is Colorado Proud School Meal Day. As a state, we are fortunate to have great fall and spring growing seasons in order to celebrate squash, corn, and watermelon! We might not have the year-long agricultural capacity of California, but we’re lucky that school is in session when local cantaloupe and potatoes are at their peak. And what better way to celebrate Colorado’s abundance than through the annual Colorado Proud Day celebration? This year, many of the districts in the 2016 SFI cohort – including Centennial, East Grand, Thompson, and Moffat – promoted their meal programs through this annual event. Sponsored by the Colorado Department of Agriculture, and in partnership with the Department of Education, our participating districts signed up to receive free nutrition educational materials for the kiddos in the form of bookmarks, math workbooks, and agricultural posters. They also received menu ideas, links to resources to help with salad bar promotion, and support in sourcing the best produce Colorado has to offer. Some examples of how participating SFI districts celebrated Colorado Proud School Meal Day included creative events like a corn shucking competition developed by the Thompson School District in Loveland. The football team and marching band squared up to see who could shuck corn the fastest, thereby creating a positive buzz around the meal program. Better yet, the cafeterias featured the freshly-shucked corn on their menus that week! In East Grand, the district created a fantastic menu featuring a peach parfait with Colorado peaches, and a confetti-corn salad for all of their students. Kristen McGuan, East Grand’s food service director, also highlighted the event on her monthly menu, ensuring parents and community members were aware of the fun-filled event. In the San Luis Valley, districts like Moffat 2 and Centennial sourced local potatoes and featured potato bars with delicious, regionally-appropriate toppings like red chili, homemade cheese sauce, and roasted veggies. For districts in food deserts, this is a fabulous opportunity to expose students to fresh produce and new ingredients. Take your school meal program to the next level and create excitement around fruits and vegetables. It doesn’t always have to be served raw, and it doesn’t always have to come out of a #10 can. When prepared and promoted with positivity, creativity, and intention, the salad bar can be an impactful teaching tool for all your students.